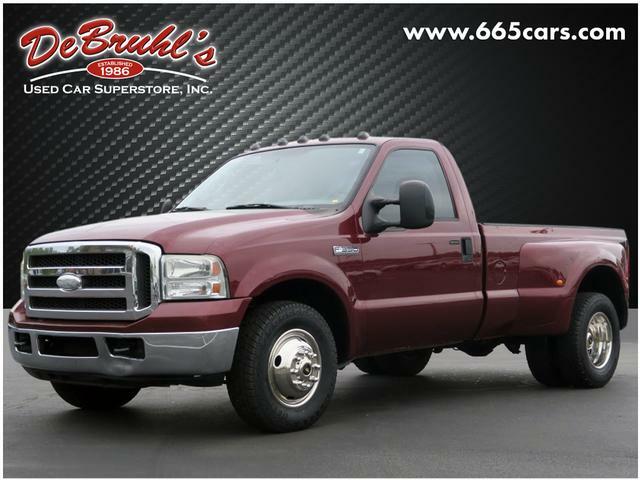 I would like to learn more about this 2005 Ford F-350 Super Duty XLT. Please contact me as soon as possible! * TINTED WINDOWS ** KEYLESS ENTRY * * 8 Cylinder engine * * GREAT DEAL AT $12,950 * * Check out this 2005 Ford F-350 Super Duty XLT * * 2005 ** Ford * * F-350 Super Duty * This Dark Toreador Red Clearcoat 2005 Ford F-350 Super Duty XLT might be just the pickup truck for you. It has a 8 Cylinder engine. Check out the driving performance on this diesel-engine vehicle. Drivers love the beautiful red exterior with a medium flint interior. Interested? Call today and take it for a spin! DeBruhls Used Car Superstore is the largest independent auto dealer in WNC! We offer a full range of financing with our guarantee credit approval, everyone is approved here.